The Tax March is a growing national movement that extends far beyond one day of marching. Led by working Americans who are tired of systems that are rigged in favor of the super-rich, the Tax March movement maintains that any reform to the tax code should be about closing loopholes for the wealthy and big corporations and building an economy that invests in working people, whether white, black, or brown, and prioritizes economic justice particularly for communities of color. The Republican tax scam passed in December of 2017 does just the opposite. In order to give tax breaks to millionaires, billionaires, and wealthy corporations, the TrumpTax raises taxes for 92 million middle-class families, rips health care away from 13 million people, and threatens life-saving programs millions of Americans rely on. With a coalition of more than 70 partner organizations and an executive committee of some of the country’s top social justice leaders and policy experts, the Tax March will continue to fight for a fair economy that works for us all. Through on-the-ground organizing nationwide, representation in town halls, and amplification on social media and in the press, the Tax March will ensure that President Trump and Congress hear us loud and clear: The TrumpTax MUST GO! Melissa Boteach, Vice President for Income Security and Child Care/Early Learning, oversees NWLC’s advocacy, policy, and public education strategies to ensure that all women and families have the income and supports they need to thrive. Prior to joining NWLC, Melissa spent nearly a decade at Center for American Progress (CAP), where she founded and led the Poverty to Prosperity Program, growing it from a team of 1 to 17, establishing projects to center the voices of low-income families; leading the team’s message and narrative change work, overseeing intersectional advocacy campaigns, and developing bold ideas to cut poverty & expand opportunity that resulted in new legislation, executive actions, and other progress. Melissa also served as policy editor on The Shriver Report, a book and multimedia platform by Maria Shriver and Center for American Progress on the 1 in 3 U.S. women on the financial brink, and solutions to help them push back. Previously, she worked at The Jewish Council for Public Affairs (JCPA), where she led interfaith antipoverty campaigns. She has testified before Congress and frequently serves as a media spokesperson on issues relating to economic opportunity. A Harry Truman and George J. Mitchell Scholar, Melissa has a Master’s of Public Policy from The George Washington University, a master’s of Equality Studies from University College Dublin where she studied women in social movements, and bachelor’s degrees from University of Maryland in government and Spanish. Scarlette began her career working with local foster kids from 2004 – 2011 with a second job as a youth theater instructor. She transitioned to business management with a second job doing campaign work for CA Congressional District 7, historically one of the closest races in the country. She is most proud of her activism, and volunteer work as a community organizer. Scarlette happily spends her free time supporting and empowering like-minded voters in other states through her executive board membership with Organize Win Legislate Sacramento 501(c)(4). She puts her stage directing experience to good use by organizing local protests, and marches, and coordinating with national progressive organizations. Scarlette is the founder of Peace Project Coalition, which acts as a local online hub for community organizers. Anna Chu serves as the Vice President for Income Security and Education, where she oversees the Center’s work in lifting women and families out of poverty and eliminating barriers in education. Prior to joining the Center, Ms. Chu served as the Vice President of Policy and Research at the Center for American Progress (CAP) Action Fund, leading its economic justice advocacy work, and was previously the Director of CAP’s Middle Out Economic Program. Ms. Chu has also served as the Policy Director for the Democratic Senatorial Campaign Committee, and has spent time on Capitol Hill as Policy Advisor for the House Democratic Caucus. After attending the University of Southern California Law School, Chu began her career as a law clerk to former Chief Judge Jane A. Restani in her sittings before the U.S. Court of International Trade and in six different federal appellate courts. Following this, Chu spent time as an attorney at Paul Hastings, Janofsky & Walker LLP. Indivar Dutta-Gupta is Co-Executive Director at the Georgetown Center on Poverty and Inequality where he works to develop and advance ideas that promote economic security and opportunity in the United States. His prior work includes positions as a consultant to foundations and nonprofits, at the Center on Budget and Policy Priorities, and with the U.S. House of Representatives Ways and Means Committee. Throughout his career, he has work to advance research and policy that advance social justice. Nicole Gill is Senior Advisor to the President & CEO of Pathfinder International, an NGO that champions sexual and reproductive health and rights worldwide. Previously Nicole served as Executive Director of Tax March and Campaign Director at The Hub Project, where she worked with coalitions to advance economic campaigns focused on helping working families. Under her leadership Tax March held the largest progressive day of action on April 15, 2017 with the first-ever Tax March engaging 125,000 participants in more than 200 communities around the country. Prior to joining The Hub, Nicole was a vice president at SKDKnickerbocker where she oversaw communications campaigns for advocacy groups and coalitions. Ezra Levin is the co-founder and Executive Director of the Indivisible Project, a D.C.-based nonprofit working to empower grassroots advocates to resist the Trump agenda through local, defensive congressional advocacy. Previously, Ezra worked as a poverty policy wonk and advocate. He’s served as CFED’s Associate Director of Federal Policy, Deputy Policy Director for Congressman Lloyd Doggett, and an AmeriCorps VISTA in the Homeless Services Division of the San Jose Housing Department. Michael Linden is a member of the Tax March Board and is the Policy and Research Director at The Hub Project and a fellow at the Roosevelt Institute. Prior to joining The Hub Project, Michael was a senior policy adviser to Senator Patty Murray on the Budget Committee and then the Health, Education, Labor and Pensions Committee. Before serving on Senator Murray’s team, Michael was the managing director for economic policy at the Center for American Progress. Michael earned his master’s degree in public policy from the Goldman School of Public Policy at the University of California, Berkeley, and his bachelor’s from Brown University. He lives in Washington, D.C., with his wife and three children. He can often be found listening to the Hamilton soundtrack on repeat. Delvone Michael is a Sr. Political Strategist for the National Working Families Party. He was the Founding Director of DC Working Families where he was architect of the DC for $15 initiative and headed groundbreaking civic engagement programs including Friends and Families and Talking Transition. Previously, Delvone worked for national labor, political, and nonprofit organizations, including SEIU, Mack Crounse, & USAction where he worked on state, local, & federal candidate development and on political and public education programs focused on workers issues and corporate accountability. Angela Peoples is an organizer, strategist and freedom fighter committed to exposing and healing the harmful truths about our collective history with race and gender. Angela specializes in creating moments that allow people to demonstrate what justice, fairness and equity means to them and their communities. Maura Quint is a humor writer whose work has been featured in publications such as McSweeneys and The New Yorker. She was named one of Rolling Stone’s top 25 funniest twitter accounts of 2016. When not writing comedy, Maura has worked extensively with non-profits in diverse sectors including political action campaigns, international arts collectives and health and human services organizations. She has never been officially paid to protest but did once find fifteen cents on the ground at an immigrants’ rights rally and wanted to make sure that had been disclosed. Connie oversees CPD’s broad-ranging campaigns for economic justice and a robust, inclusive democracy, as well as the organization’s research efforts. She had previously served as CPD’s campaign director and research director. Prior to returning to CPD, Connie was Vice President of Policy and Research at Demos, where she directed the work of the policy team and developed a social exclusion framework to understanding the drivers of racism in the US. She has worked for economic and racial justice for nearly a quarter century, as a union activist, organizer, researcher, policy analyst, and strategist. She holds a BA from Georgetown University and an MA and PhD from the University of California at Los Angeles. Zach Silk is the President of Civic Ventures. He is an experienced civic entrepreneur and successful political progressional. He has run some of Washington states’ highest profile campaigns and is recognized as a national expert on organizing, organizational management, and strategic communications. Silk started his career as a community organizer. He spent over a decade running campaigns big and small across the country and then went on to manage the successful campaign to pass and defend Washington State’s marriage equality law in 2012. He subsequently co-founded the Alliance for Gun Responsibility and went on to run the nation’s first successful background check ballot measure in 2014. He now leads a team of political troublemakers at Civic Ventures working to create disruptive innovation in the civic sphere. Silk has been featured in a variety of publications and is a frequent commentator on public policy. His opinion pieces have been featured in the Guardian, the Stranger, and the Seattle Times, among other publications. Zach received his Masters in Public Administration from the University of Washington’s Evans School of Public Policy. Gwen Snyder is a community organizer from Philadelphia, and the lead organizer for Tax March Philly. As the executive director of Philadelphia Jobs with Justice, she coordinates a coalition of student, labor, community, and faith organizations that runs direct action campaigns to win concrete victories for workers and their families. Jennifer Taub is a Professor at Vermont Law School where she teaches courses in Contracts, Corporations, Securities Regulation, and White Collar Crime. A graduate of Yale College and Harvard Law School, prior to joining academia she was an associate general counsel at Fidelity Investments. Taub has researched and written extensively about the 2008 financial crisis, including the book, Other People’s Houses, which includes a chapter dispelling the top ten myths about the crisis. She is also the co-author of Corporate and White Collar Crime: Cases and Materials. 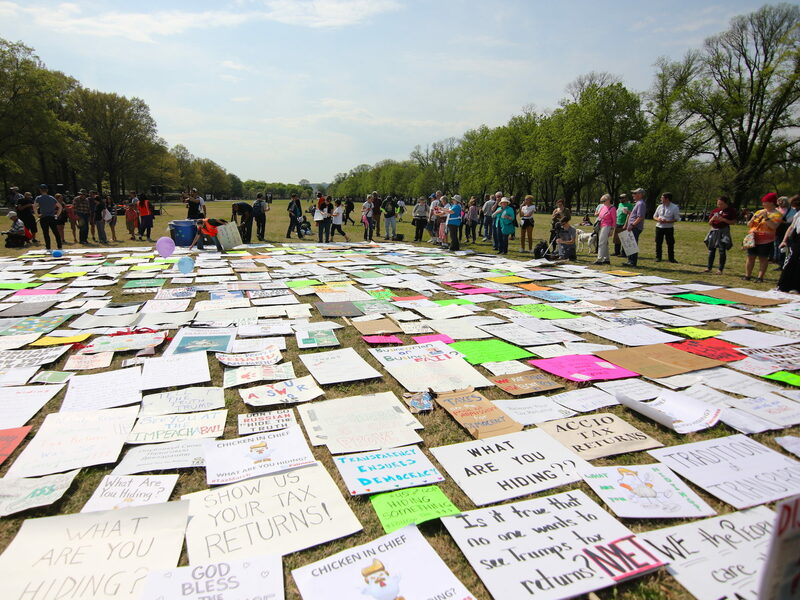 More than 125,000 people came out on Tax Day 2017 to demand Donald Trump’s tax returns and a fairer tax system for all. On Tax Day 2018, people from across the country came together once again to express their outrage at Donald Trump and Republicans in Congress for passing one of the least popular tax bills in recent history. The power of our movement is undeniable, but the fight is just beginning. If you believe America’s middle class deserves better, add your name below, and we will keep you posted on events near you. Read our Principles from the original Tax March!